Grammy Award winning artist Stevie Wonder, one of the most influential musicians of the 20th century, was born May 13, 1950 in Saginaw, Michigan. An excess of oxygen and a disorder affecting his retina called retinopathy resulted in him being born blind. In 1954 his mother Lula moved all six of her children to Detroit, Michigan. 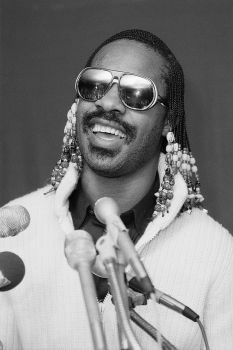 Influenced by Ray Charles and Sam Cooke, Stevie began working immediately in the studio under record producer Clarence Paul. Wonder’s first number one hit “Fingertips, Part 2” (1963) displayed his skill on the harmonica. Other hits including “Uptight (Everything’s Alright)” and “Hey Harmonica Man” made this instrument a trademark for Stevie. By 1970, Stevie Wonder had married fellow singer Syreeta Wright who appears in the song “Signed, Sealed, Delivered.” This record marked his debut as a record producer as well as singer. In 1971 he began producing his own albums. Songs such as “My Cherie Amour” and “You Are the Sunshine of My Life” came out of this era of artistic freedom. Wonder also revolutionized music by using synthesizer instrumentation in his songs. From 1972 to 1976 Stevie Wonder released four albums from which he received a total of 12 Grammy Awards. He won more Grammy Awards than any other Motown artist and continues to add to his grand total of 22 to date. In 1976 Wonder wrote the song “Isn’t She Lovely” as a tribute to the birth of his first daughter Aisha. Stevie Wonder has worked with several artists of many genres of music such as Michael Jackson, Bob Marley, Dizzy Gillespie, Paul McCartney and Snoop Dogg. In 1985 Wonder co-wrote “We Are the World,” the recording that raised money for African famine relief. He also provided his talents the following year in “That’s What Friends Are For,” a song composed by Burt Bacharach and released to support the American Foundation for AIDS research. Stevie Wonder’s songs were often anthems for major events in African American history. His 1966 cover of Bob Dylan’s “Blowin’ in the Wind” became the theme song for black and white activists in the Civil Rights Movement. His song “Living for the City” in 1973 described black urban poverty and his 1980s rendition of “Happy Birthday” helped launch the campaign to make Dr. Martin Luther King, Jr.‘s birthday a national holiday. In 1996 Stevie Wonder was awarded the Grammy’s Lifetime Achievement Award at age 46. He continues to influence music and musicians in the 21st century.